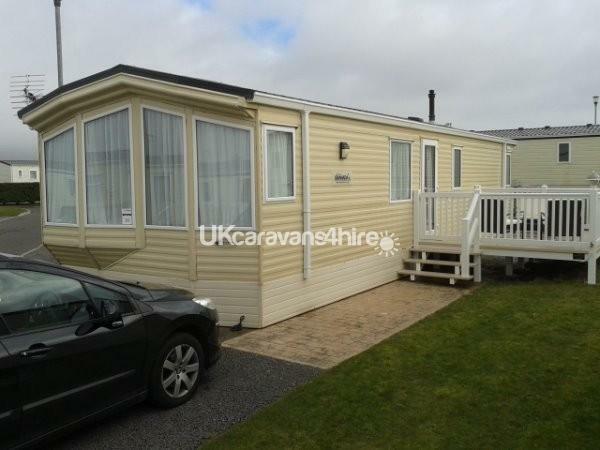 Spacious and Modern 6 berth caravan in a sought after cul-de-sac location of the Trecco Bay site midway between the main street and the Trecco Bay blue flag beach. We rate this caravan (our third in Trecco Bay) as our best to date and will be doing all in our power to ensure that our guests are equally as impressed throughout their stay. The caravan has a very generously sized lounge with comfortable and ample seating, a 42" flat screen television (connected to a freesat satellite dish) dvd player (which also plays CDs) and a modern flame effect electric fire. There is also a double pull out bed. The dining area has a freestanding table and traditional dining chairs and the kitchen a generous amount of storage space, gas cooker with extract fan, microwave, toaster and a full sized fridge/freezer. We also provide a good quantity of pots and pans, casserole dishes, crockery, cutlery and glassware to the extremes of cheese and steak knives and even a teabag squeezer!! We do strive to achieve a home from home feel. Actually if you are looking to eat out because there isnt enough pots and pans etc. The excuse may just not work so we just suggest saying instead because you are on holiday!!?. The master bedroom has a king bed, ample cupboards, an en suite and a flat screen television! 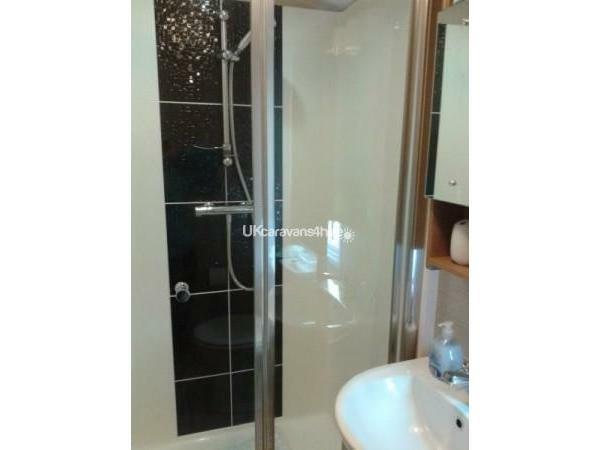 There is also storage in the twin room and a separate bathroom with a good sized walk in shower. All you need to bring with you is your towels as the beds will be made up ready for you. The substantial decked area with its rattan style furniture, lights and lockable gate is the icing on the cake. It is somewhere, no doubt, where many of the World's problems will be solved by guests during their stays! We provide a range of CDs , DVDs, books, games and toys besides some essential provisions like toilet rolls, kitchen towels, cling film, foil, washing up liquid, liquid soap, sauces, tea, coffee, sugar and sweets etc. and even a welcome bottle of wine (if you do not drink and let us know in advance we shall, of course, be happy to provide an alternative). All gas & electricity are included in the our prices and bedding can be provided at an extra cost as long as pre-booked. One small dog will be welcome. If you do wish to venture away from the caravan during your stay the "main street" offers a restaurant, Sportsman's Bar (with large screens tuned to popular sporting events, darts and pool), separate amusement arcades for adults to children, dodgems, children's bowling alley, a fish & chip shop, pizza and waffles parlor, supermarket, gift and rock shops, launderette and a church. There is a crazy golf course, wet play area and sports court. There is also an impressive pool which can be accessed on a pay as you go basis or by use of passes which can be purchased on arrival (these passes do also cover the evening live entertainment). There are two live entertainment venues (one is for adults only). To access the evening shows in either of these venues passes do need to be purchased but there is much going on during the day for younger guests which does not require passes. There are also kid's clubs which children may attend. .....and if you even wish to venture further afield there is the coastal path with easy flat walks to Newton village in one direction (which has a couple of pleasant village pubs and a lovely village feel) and Porthcawl in the other with its funfair (donkeys on the beach in the peak season) beaches and shops. If you do not feel like walking there is actually a bus service to take you directly from the site to Porthcawl town. There is a golf course just a couple of miles away and Margam Park just a little further for cycling and other activities including Going Ape. Porthcawl is approximately half way between Cardiff and Swansea opening up a heap of opportunities for days out including the Mumbles, Barry Island, Welsh Folk Museum, Dan yr Ogof Caves (dinosaur museum), Brecon Mountain Railway (steam train) and the Big Pit to name a few. For first time guests, we do request payment of a £100.00 damages bond but, rest assured, that this will be returned to you, if not on the day of your departure, within the week following, providing all is well at the time of you checking out. We do hope that this will not deter you from booking with us. Additional Info: Evening live entertainment venues ie Showdome and Timeout. There is the option to pay as you go in the pool instead of buying a pass. Indoor pool may be used on a pay as you go basis Sportsman Bar Outdoor Play area Sports Courts. What a wonderful caravan, beautifully presented, extremely clean and well equipped, with personal touches and welcome gifts. This is our third stay in one of Fred and Margaret's caravans and they have all been lovely and are the best private caravans we have ever stayed in. We will definitely be booking again in the future. Yet another excellent stay. Will be back soon. Thank you for all the treats. So glad you enjoyed yourselves despite the extra "uninvited guest" in storm Brian.! We look forward to your next visit in 2018. Thank you so much for the lovely review. So much appreciated and we look forward to your next visit. Thank you so much for your review and for leaving everything in the caravan so perfect on check out. We indeed look forward to your return in the future. Thank you so much. So glad you enjoyed your stay and we too look forward to your next visit. Brilliant accommodation very comfortable and clean. The welcome gifts were a lovely extra. Everything we needed and more. Would love to return. We have been coming to Trecco bay for 14 years and this is the first caravan that we want to book again,it has everything that you want for your stay and wonderful little extras,i will be telling other people about your caravans,thank you very much. Thank you so much for the review...we just wish that the weather had been kinder!!! We sincerely hope that you will return one day. We had a fantastic time during our stay in your caravan. Everything we needed was catered for. The kids loved the welcome pack and it was spotlessly clean. Looking forward to coming back later in the year. Thanks again. Thank you so much for your review. Very much appreciated and we very much look forward to the return of you and your family over October half term. We, in turn , thank you for leaving the caravan so spotless when you left. Once again we had a fabulous stay in your beautiful caravan,so well equipped everything you need for your stay and these little extras you provide make it so homely,thank you for the welcoming gifts which everyone enjoyed especially ozzy,the caravan is so homely and cosy and we couldn't of asked for anything more,we wouldn't want to stay anywhere else and as you know we are definitely coming back.